If this monster is destroyed and sent to the Graveyard, this monster is Special Summoned with an ATK and DEF of 1000 during the End Phase of the turn. This effect can be used only once during the current Duel. We now look at another underplayed, underrespected card. Sanganable, Witchable, all-around searchable. It almost guarantees a free Tribute (except if DDWL or something like it attacks it). They kill it, you get it back, you Tribute it. This thing should be errata'd to say if Fiber Jar resets the duel it can use its effect again, so that you can play 3 of this. It's not THAT powerful. Regardless, it's a good asset for someone who may be playing a Tribute Deck. Twin-Headed Behemoth, a Super Rare from Legacy of Darkness, is in my opinion one of the most overlooked monsters in the entire game. It's Witchable; it's Sanganable; it's Kamakiriable. It's Level 3 so it can attack under G-Bind. It has 1500 ATK, which isn't bad at all for a Level 3; it can kill a Don and match a Lady. The effect is a nice one. If Behemoth is destroyed (and yes, this includes as a result of battle AND card effects like Raigeki), he will return at the end of the turn. You can choose to put him in either ATK or DEF, and his stats for each will be 1000 (not great, but it could be worse). The new Behemoth can be a mini beatstick to hit for some damage, a little defensive wall, or you can just launch him with CS/sacrifice him for a high level. Basically, the effect = card advantage, something which is of vital importance in today's game. 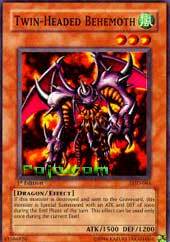 In a Dragon deck he's especially useful; you can use the new Behemoth as sacrifice fodder. Control decks also might definitely want to consider this guy. He works very well.